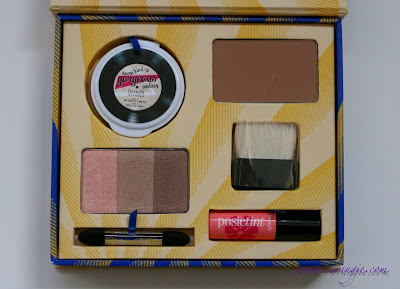 Here's a nice little bronze-themed makeup palette from Benefit, just in time for spring break. It's compact and even a little minimalist, but it has just about everything you need for a full face. The Benefit Cabana Glama palette opens up to reveal a full mirror and an inner tray that can be removed so you can use the box for other purposes (it's a good size for storing photos) after you've finished the makeup. The products included in the palette are a travel size (0.12 oz) Some Kind-a Gorgeous in Medium, a mini (0.14 oz) Hoola bronzing powder with brush, an eyeshadow trio in Peach Fizz (golden peach sheen), Bronze Buzz (tan sheen), Cocoa Pizzazz (warm brown sheen) (0.12 oz net), a double-ended sponge tip applicator and a travel size (0.08 oz) Posietint. The Some Kind-A Gorgeous and Posietint are removable. The Hoola and shadow trio are part of the palette, but I'm sure you could depot them fairly easily. Benefit Some Kind-A Gorgeous in Medium. Some Kind-A Gorgeous is what Benefit calls a "foundation faker". 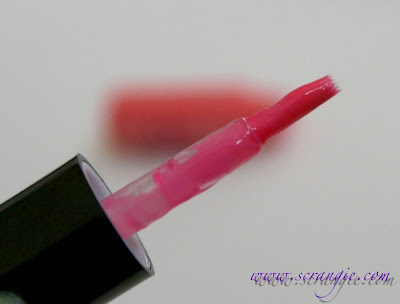 It has a melty, balm-like texture and a sheer, tinted finish. 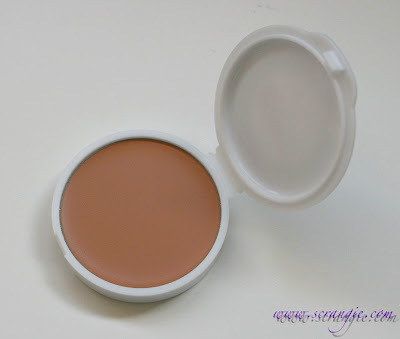 It's described as a cream-to-powder formula, but it feels more like a primer texture than a powder. I've used this several times in the past and I've never been able to get this product to work for me. It has no coverage and doesn't seem to actually do anything. Maybe as a base for regular foundation? I suppose if I already had perfect skin, this would be a nice, light tinted product, but I don't. Benefit Posietint. 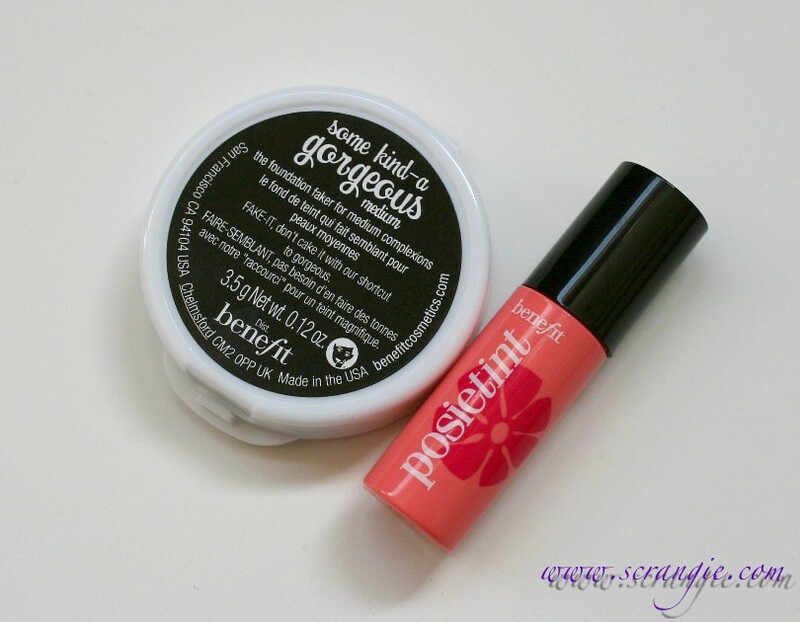 Posietint has a light gel texture and feels cool and weightless when applied. It can be used on both lips and cheeks, though it does have a strange taste (like all stains) when used on lips. It's smudge- and transfer-proof, making it a good choice for hot weather. The shade is a very pretty light/bright pink on my skintone and I find it much more flattering on me than the original Benetint. Here's everything swatched without primer, natural light and flash. Left to right: Eyeshadows in Peach Fizz, Bronze Buzz, Cocoa Pizzazz, Hoola, Posietint, Some Kind-A Gorgeous in medium. The shadows are all very sheer, but soft and velvety going on. The color is buildable, but not to dramatic levels unless it's applied wet. 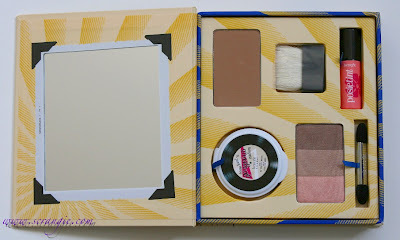 Hoola is a light matte bronze that blends beautifully like all of Benefit's boxed powders, but when applied heavily, it starts to turn a little orangey on my skin tone. Cute packaging. You can always count on Benefit for that. Products all have full-size quality and perform as expected. No watered-down "value set" formulas here. Portable size palette with travel-sized products, good for packing light. Colors all go perfectly together for an effortless polished bronze look. The peach shadow makes a good highlighter used together with Hoola bronzer on the cheeks. Palette can be re-purposed when the products are removed. I always like Benefit's flat/square blush brushes, even the travel sized ones. I don't get Some Kind-A Gorgeous. Anyone who uses this want to clue me in on what it's good for? The neutral tones in this palette don't really appeal to me. I'm not much of a neutral-wearer and brown eyeshadow rarely excites me. Posietint feels drying on the lips after a while (it's a water-based stain that leaves a slight film), so you need balm or gloss to go with it. Hoola can get orangey if applied heavily on fair skin tones like mine. Go easy and blend well and it'll look awesome, just don't overdo it! 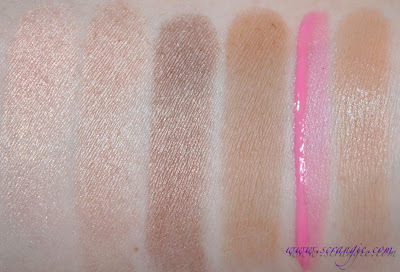 Overall, it's a cute palette for someone who wants a soft, neutral bronzey-beachy look with a pop of hot pink, but, on the whole, this palette is just too subtle for me. All of the colors are very easy to wear and flattering for a wide range of skin tones, and every product in here is top quality, but I personally have a hard time getting excited about neutrals. The peach eyeshadow shade is my favorite thing in here, and I do like it enough that I would buy it full size. It has a sort of rosy-gold duochrome on top of the pinkish-peach base that looks really bright and pretty on my eyes. 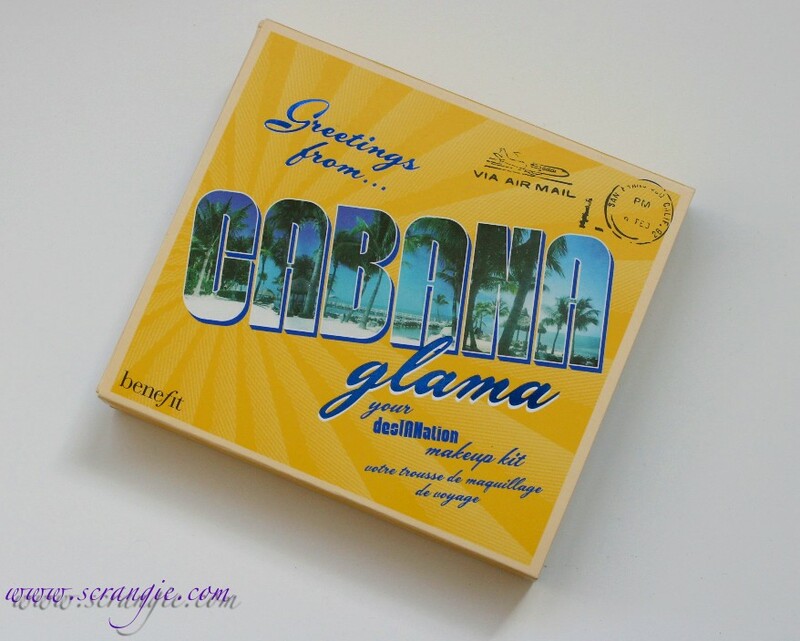 Benefit Cabana Glama is available now and retails for $36. I have a friend who uses SKG as her foundation but she has great skin and she uses it mainly to even her skin tone. I tried it but I had to put on many layers to even out my skin tone, so I went through the entire thing in a few days. It can be nice as a "refresher" after work before going for drinks instead of powder. I couldn't agree more about Some Kind-A Gorgeous... What a strange product. $36 seems a little high for this product, but perhaps I'm just cheap... Maybe if it came with a Bad Gal Lash mini in addition or instead of the SKG. Think I'll pass on this one, sorry Benefit! Great review as always, thank you! I wouldn't pay $36 for this set eitherrrrr. Or anything more than $15 for that matter. This set doesn't really do anything for me. I love Benefit, but I wish they wouldn't just stick the Medium shade of SKG in every set they do! Skin tones vary, give us some options! I agree with swatch and learn about the colors. 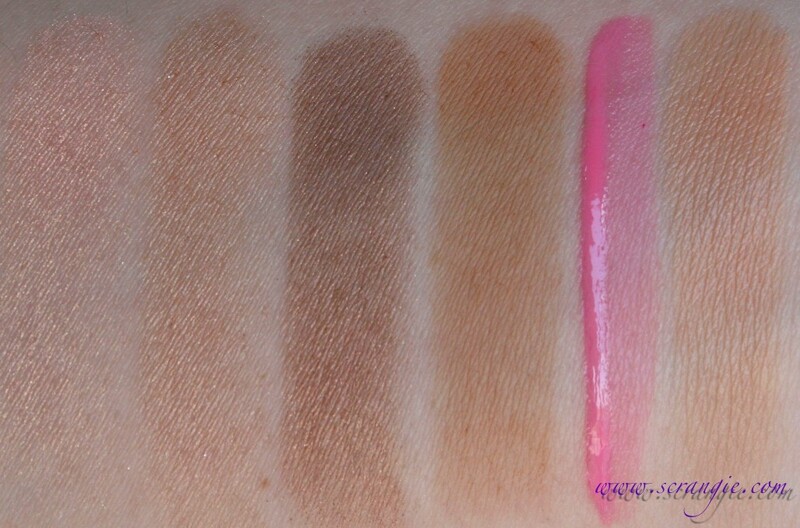 You are the first blog I started following because of your color choices and gorgeous swatches. I feel like you understand me when you show really bright funky looks. I came looking for nails, found fun makeup, and was hooked ever since. Some Kind of a Gorgeous is kind of like a tinted moisturizer. (Sephora says: "This lightweight, translucent, foundation-like product smoothes out imperfections and evens skin tone with a silky, smooth finish that's super natural and super gorgeous.") The lightest shade is actually too dark for me, so my mini in my $10 Benefit mini went into the bin pretty much right away. Definitely not a Scrangie palette, but I think $36 is a pretty good price for this, considering how much each of those products are individually and in full size (each of the eyeshadows would have been $18; Hoola, $28; Some Kind of Gorgeous, $29; PosieTint, $24.) I actually love this and would buy it if Hoola weren't scented! Benefit's products really don't appeal to me. I really LOVE their packaging but couldn't bring myself to buy anything, don't really know why. I thought of maybe buying Hoola or Coralista but eventually I splurged on something else. ¡Qué kit más completo! Es precioso. It's always nice to be reminded that I'm not the only one who doesn't get excited by neutrals and therefore doesn't really see the appeal in this box. The colors don't call to me, and personally I'm not a fan of how everything is scented (I can put up with the scented blushes, but not a fan of the glosses at all). One of these I'll get around to trying their eyeshadow. This won't be the occasion though! SKG is Benefit's foundation. Although they are supposed to be bringing out a liquid foundation this year. I seem to recall reading that somewhere. Their B. Right Radiant skin care range, launched last year, is really nice, especially the eye cream. Dandelion is the only blusher I use, but otherwise, there isn't anything else in the Benefit range that I like enough to pay what they charge for it. Thanks so much for posting these palettes. I'm usually tempted by these things. I know I can skip this without feeling I'm missing out on something.